Royal Dandoo Palace of Houseboats has made a name by enriching the tourist’s stay in Srinagar with its excellent facilities and warm hospitality. This luxurious house boat makes sure that you have a divine and vivid view of the Dal Lake in a very calm and cozy environment while you feast upon mouth-watering food and complimentary Wi-Fi. 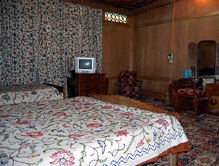 Royal Dandoo Palace of Houseboats is the perfect accommodation in Srinagar for travelers who want to experience the traditional style of accommodation inSrinagar. Situated at approximately 14 kilometers from Srinagar International Airport, it is easily accessible and tourists in Srinagar can easily visit the nearby attractions as well. How to Book: Reservation in the Royal Dandoo Palace of Houseboats can be done with Tour My India. We have the best deals for Srinagar houseboat reservation and make sure that you have the time of your life. 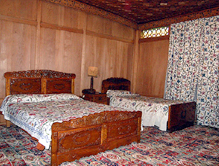 We make sure that travelers in Srinagar get the best accommodation and offers. Apart from providing accommodation and travel packages, we also cater to the adventure needs of tourists by organizing thrilling activities like Skiing, Trekking, Rafting, Trout Fishing and many others.